Two videos have been released by the BBC of five episodes from series one. The episode entitled West Coast Story is not available on video because of copyright problems. For online ordering of the videos try Blackstar Video who do free shipping worldwide. From my own experience of buying videos from them I'd recommend them for a fast, trouble free, service. "The Great Lochdubh Salt Robbery" and "A Pillar of the Community"
Lochdubh: A frontier town in the wild west of Scotland. 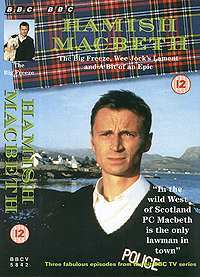 One hotel, one general store, one doctor and one lawman - PC Hamish Macbeth, with his own singular methods of dealing with crime and misdemeanours. When a notorious bully disappears, and three hundred weight of salt go missing from the village shop, Hamish (and his canine side-kick, Wee Jock) sniff out the unsavoury connections. Many a baffling mystery and outrageous scam lurk behind the closed doors of Lochdubh; and Hamish needs all his skill to keep the big boys from Inverness off his patch. "The Big Freeze", "Wee Jock's Lament" and "A Bit of an Epic"
Welcome to Lochdubh on the wild West Coast of Scotland. 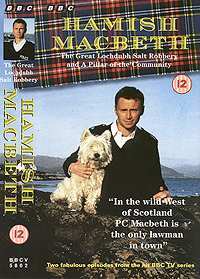 Here PC Hamish Macbeth is the law - cool, practical - above all, a man who knows the Highland way of life. On the streets of the village, Hamish has respect. TV John, Doc Brown, Rory the grocer, even the ne'r-do-wells Lachlan and Lachie Junior stick together. It's the "outsiders" who cause the trouble - and Hamish sorts it out in his own particular style. Why must he convince the big boys from Inverness that the infamous Raspberry Ripple Gang has hit town? Does he have murder in mind as he stalks two escaped convicts who have brought tragedy on the village? Has Wee Jock, Hamish's beloved Westie, gone forever? And will a life-or-death experience on the mountain show him where his heart truly lies?